I AM NOT A TV or a STAR!!! or a TV STAR!!! (this is what I get for using a website builder template) Help me build a better website!!! My goal now, is not to build a better website, but to create a crappy one. Why should I have a fancy site with sound and animation and nice colors, a site that people want to keep coming back to. WHY? Why should I inflate myself, telling you about all my achievements, gloating about how great I am...blah, blah, blah. If I had a great website, would you think I'm this great comedian, doing all these great things? I'm a great comedian, doing Great things...with a crappy website. I no longer do stand-up comedy. And if you came to this site and can't access the pages, well, it's a crappy site. I don't know what happened but I'm working on getting all that fixed. Let's see how long it takes me. Helen Maalik was born in Damascus, Syria, and came to the United states at the age of 7. It wasn't easy growing up as an Arab kid in this country. She got relentlessly taunted by kids and developed quick with and a sharp tongue. She even had to beat up a couple of boys in the 8th grade. She became an interior designer and has had projects published in trade magazines. She quickly realized that she would rather make fun of her clients than design for them. 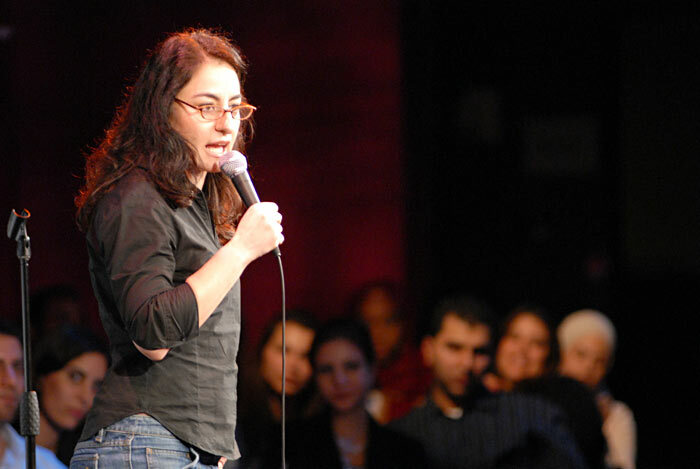 A stand-up comedienne based in New York City. Helen performs regularly at top comedy clubs She puts an audience at ease as soon as she steps on stage with her charming and subtle presence, but wait till she starts talking. She throws jabs about her husband, marriage and being from the Middle East. Her observations are keen and humorous and will make you think about the mundane. Her well crafted material and sarcastic wit gives this comedienne an edge and a fresh voice to comedy. She was featured on ABC's '20/20' on a segment about Arab American Comedians and had a recurring role as an 'on-air' interior designer on the Oxygen Network's home improvement show 'Nice package'.